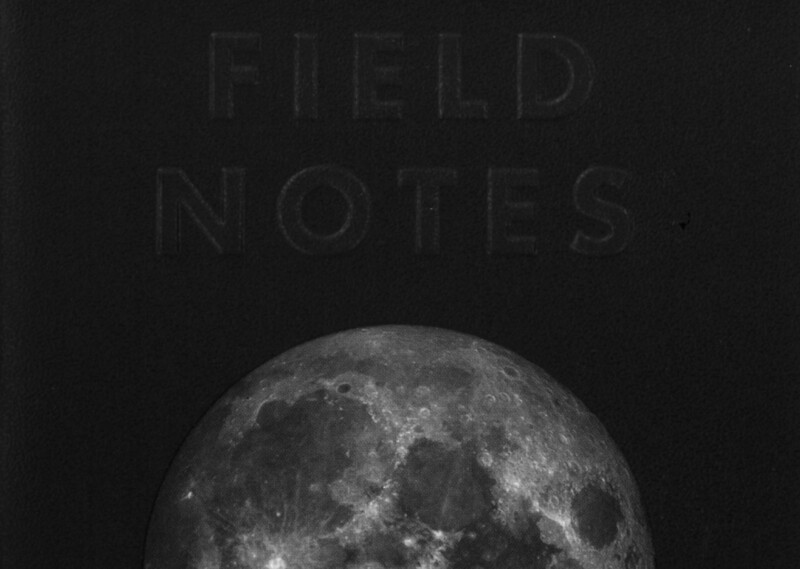 The next Field Notes edition, Black Ice, has already been announced, so posting this Lunacy review end of November means I’m a bit late to the party, but anyway: here’s a quick look at the paper used in the Lunacy edition, Domtar Earth Choice and a comparison with the best and the worst Field Notes paper I have used so far. The Finch Paper Opaque Smooth 60#T “Bright White” that can be found in the original Field Notes was a disappointment. Graphite is quite light on this paper – I guess it would make good paper for soft leads, though. Ink, from fountain pens and even from gel pens, get sucked into the paper and is happy to bleed easily through the page …unless you have a very dry pen. The new Black Ice edition will use Finch paper again, but this time “Bright White” Finch Fine Smooth 70# text paper. The description on Finch’s website sounds as if Finch Fine is better paper than Finch Opaque, but the information on the website is written for people printing on these papers, not handwriting on these papers, so for me, it remains to be seen whether Fine is better than Opaque. If you own the America the Beautiful, Frost Gray or DDC Orange editions you have used Finch Fine in a different colour so you might be able to judge whether it is better for handwriting, drawing etc. So here’s the ‘new’ Domtar paper. According to their website it’s “the largest family of environmentally responsible papers ever assembled” (not the most environmentally responsible papers ever assembled). Looking at the Domtar website I think Domtar Earth Choice “Gray” 60#T with “Moondust Gray” must be the Earth Choice Colors Opaque Text, but I’m not 100% sure. Looking at this Paper weights table I guess the 60# weight used for this paper must be equivalent to 90g/m². The paper is tested using the same parameters as in previous paper tests and explained here. In short: The pencil lead used has a nominal diameter of 0.7mm and an actual diameter of 0.68mm (more info about nominal vs actual diameters can be found here). This is equivalent to a surface area of 0.36mm². A force of 1.5N is used, which, in this case, is equivalent to 4.17 MegaPascals for this surface area. 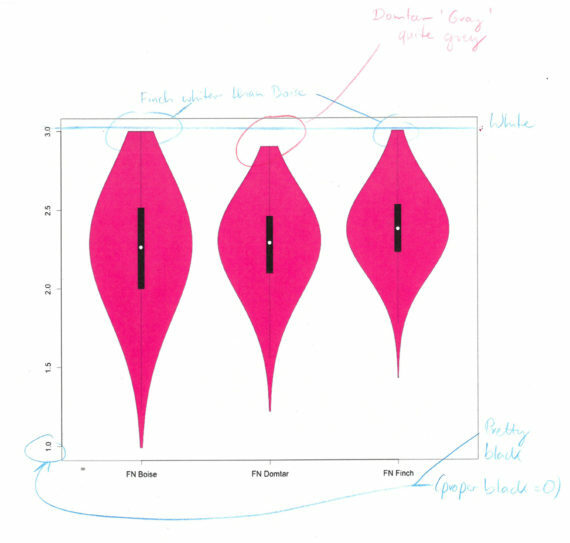 The violin plots show how dark the pencil marks left on the paper are. The general idea is that darker marks are easier to read and are therefore better. Darker marks result is violin plots that are lower positioned and black values would be low (near 0 on the y-axis (left)), while light marks are towards the top. Well, it’s grey paper, so there’s no surprise when we see that the violin plot shows that Domtar’s ‘violin’ doesn’t get anywhere near the white value reached by Boise or Finch paper. If you look closely you can also see that the Boise paper is not as white as the Finch paper. If you look closely at the marks left by graphite you can see that the paper will ‘shine’ through the line written on the paper as the roughness of the paper means that graphite isn’t left evenly on the mark left. This is where the paper colour for the test can be ‘picked up’ by the violin plot. The Domtar paper doesn’t take graphite as well as Boise (County Fair) paper, but certainly better than Finch (Original/Kraft) paper. Because of the lower starting point, due to the greyness of the paper, overall ‘contrast’ isn’t however much better than the Finch paper. I am happy to say that the Domtar paper behaves much better with ink than the Finch paper. For pencils, there is better paper out there, e.g. Atoma, Banditapple or Silvine, but the paper quality is not the main attraction of the Field Notes anyway. If you like to read more about the Field Notes Lunacy edition have a look at Ed Jelley, Fountain Pen Follies, OfficeSupplyGeek or Pens and Junk. For anything Field Notes related please visit Three Staples. Update 25 Nov 2016: I just finished listening to The Pen Addict Podcast #232, where Brad and Myke give further insights into the paper used for different Field Notes. The question about Field Notes paper starts at 1:10:10. In case you wonder about how I use the Field Notes in the photo: The yellow County Fair contains notes from medical visits from our son, the Lunacy one isn’t being used yet, and in the Original one, labelled ‘Ausgaben’, I try to follow Sola’s example and try to keep notes of money spent.